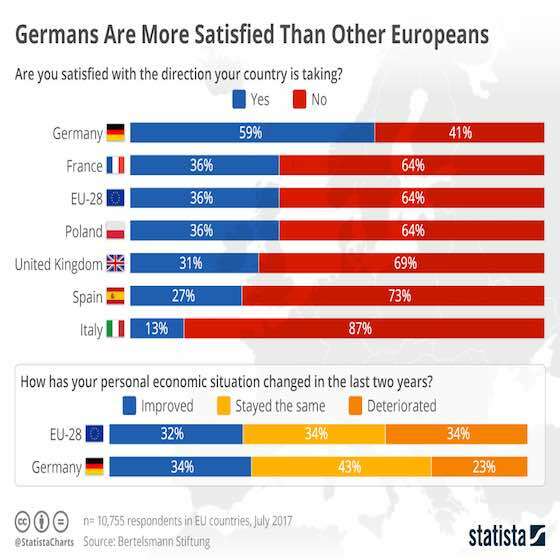 Germans Are More Satisfied Than Other Europeans according to recent research. According to research conducted by the Bertelsmann Stiftung, Germans stand out among Europeans for being positive about the direction of their country. 59 percent of those polled were satisfied with the direction their country is taking while 41 percent were dissatisfied. That's far higher than the European average of 36 percent satisfaction. When it comes to the economic situation in particular, 35 percent of people in Germany think it improved over the past two years while 43 percent think it has stayed the same. Europe: "Satisfaction Levels Around Europe"